Liam Cameron is promising Nick Jenman the hardest night of his career, when they meet at iceSheffield Arena on Friday. 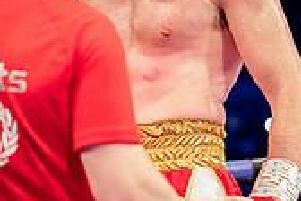 Brighton’s Jenman has stepped in at short notice to face Cameron for the home fighter’s Commonwealth Middleweight Title, after the withdrawal of Danny Butler. The clash is ‘Cannonball’ Cameron’s first defence of the belt, which he won against Sam Sheedy last October. Southpaw Jenman, 20-10-1, was in action as recently as late March, when he lost a tight decision to Andrew Robinson for the vacant IBO Continental Middleweight crown. Liam has his sights set firmly on a future British title challenge against the current champion – a man he has already beaten in the amateurs – Tommy Langford. Cameron, 27, isn’t overlooking Jenman though. “It’s just frustrating to have opponents keep pulling out,” explained Liam. “I don’t understand why they pull out. To get the opportunity to box for the Commonwealth Title against Sheedy, I had to fight for peanuts. There are loads of boxers that have been offered this fight who will possibly make more money than I am, and they still aren’t taking the fight; just pricing themselves out of it. “So, it’s great that Jenman has stepped up. But I will break his heart to bits on fight night. I’m no Robinson and this, if it goes 12 rounds, will be the hardest fight of his life. I’ve never seen him box; I’m not really interested. He’s been stopped by Tommy Langford and he’s lost 10 fights. If I can’t beat Jenman then, no disrespect, I’m going nowhere in boxing. It doesn’t matter how hard he’s trained or how up for the fight he is; and if being ‘up’ for fights won you titles then I should already be world champion!